Where: St. John’s Presbyterian Church, 2727 College Avenue, Berkeley, CA. 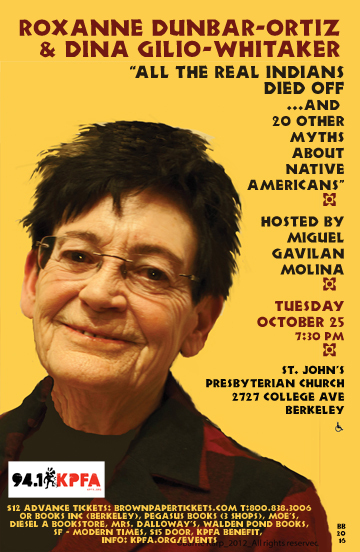 201610257:30 pm 201610257:30 pm America/Los_Angeles An Evening with Roxanne Dunbar-Ortiz & Dina Gilio Whitaker All the Real Indians Died Off (And Twenty Other Myths About Native Americans) KPFA Radio 94.1FM presents: Tuesday, October 25, 2016 7:30 PM St. John’s Presbyterian Church, 2727 College Avenue, Berkeley Advance tickets: $12 : brownpapertickets.com :: T: 800-838- 3006 or Books Inc,Pegasus (3 sites), Moe’s, Walden Pond Bookstore, Diesel a Bookstore, Mrs. Dalloway’s S.F. – Modern Times $15 door All the Real Indians Died Off (And 20 other … Continued St. John’s Presbyterian Church, 2727 College Avenue, Berkeley, CA. All the Real Indians Died Off (And 20 other Myths about Native Americans) critically deconstructs persistent myths about American Indians that have taken hold in the United States. Authors Roxanne Dunbar-Ortiz and Dina Gilio-Whitaker tackle a wide range of myths about Native American culture (“Indians Are Naturally Predisposed to Alcoholism,” “Sports Mascots Honor Native Americans,” “Native Americans Can’t Agree on What To Be Called”, etc) and trace how they developed. The authors deftly show just how these myths are rooted in the fears and prejudices of European settlers and the larger political agendas of the settler state aimed at acquiring Indigenous land. They can be traced to narratives of erasure and disappearance. Roxanne Dunbar-Ortiz’s previous book “An Indigenous Peoples’ History of the United States” received ther 2015 American Book Award and the 2015 PEN Oakland Josephine Miles Award for Excellence in Literature. Roxanne Dunbar-Ortiz grew up in rural Oklahoma, the daughter of a tenant farmer and part-Indian mother, and has been active in the international Indigenous movement for more than four decades. She is the author of eight other books. Miguel Gavilan Molina is a longtime progressive activist working primarily with Indigenous Peoples’ and environmental concerns. In addition, he is a veteran producer of KPFA Radio’s weekday show, Flashpoints.